The private estate, renovated for the Sweeney family, is a perfect reflection of their individual style and offers a warm and sophisticated welcome to visiting family members and guests. The remodel encompassed the main living areas and spacious outdoor space, as well as coffered ceilings and refined woodwork throughout the home. Reflective of the homeowner’s desire to capitalize on their lake views and large exterior space, the project integrates a myriad of natural materials and architectural enhancements. Upon entering the home, one is immediately drawn to the harmonious blend of wood, marble and keystone effortlessly flowing through the home and spilling into the outdoor space. Harwick Homes, together with Collins & DuPont Interior Design Group, delivered an outdoor living space beyond the Sweeney’s expectations. From floor to ceiling, this home’s unique use of natural elements illuminate the home with natural light and a seamless transition to the outdoor living space, comprised of the family pool and large sitting area. Perfecting the project, architectural roof tiles, custom iron hand rails and lush landscaping were artfully chosen to compliment the owner’s style and elegance. The Sweeney estate personifies Harwick Homes’ impeccable attention to detail inside and out. “We take great pride in understanding our client’s personalities when designing a home,” said Shane Klepko, Vice President of Harwick Homes. “It is more than a project or a renovation, it is a reflection of the family themselves,” he said. 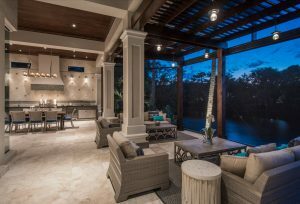 Harwick Homes has been delivering homes of distinction to Southwest Florida for over 25 years. Utilizing the highest standards in technology, materials and craftsmanship, Harwick Homes specializes in working with clients to develop the ultimate strategy for success. At Harwick, the difference is in the details. Located at 3368 Woods Edge Circle, Unit 101 in Bonita Springs, Florida, their offices can be reached by calling (239) 498-0801 or by emailing info@HarwickHomes.com. For more information, please visit their website at www.HarwickHomes.com. The Sweeney residence marries natural elements with rich finishes to provide a seamless transition between spaces.